In a post earlier today, I asked the question I would have asked Friday at a panel on the New York Times Innovation report (I was at the microphone, next to speak, when time ran out). Thank you so much for your question! I wish we’d had more time during the panel and had been able to get to it! This is a really common question that we’ve been asked many times. Of course, it seems like the supreme irony that a report designed to tackle issues of digital innovation was printed out, on heavy stock paper,* for small distribution, which ultimately ended up going viral on a grainy photocopied PDF shared on Buzzfeed. As I tweeted during on Friday, this irony was not lost on any of us that worked on the report. Of course there are very good reasons why any internal strategy document at any company should remain private — it might contain confidential data, or present a roadmap for competitors to strategize around — but in hindsight, I think we were all glad the report ended up being a public document, and its release has opened up more conversations in the newsroom about the positive effects of a more public kind of conversation around these questions. But the really simple answer to your question was that the report was commissioned by Jill Abramson, and it was up to her and her senior leadership team to decide what they wanted to do with it. (Keep in mind that when we delivered the report, as a group, we had no idea if the senior leadership of The Times would embrace any of these recommendations. That they ended up enthusiastically embracing all of our recommendations was a (pleasant) surprise to us.) And if I recall correctly, there was at least one question I heard in a meeting with newsroom leaders about whether the full report should be released more widely. This was shortly before events unfolded which overtook that conversation. * I was the one who went to the Office Depot to buy that heavy stock paper. It was really nice quality! The pseudonymous bloggers @blippoblappo and @crushingbort deliver withering criticism of CNN in a guest piece on Esquire.com. 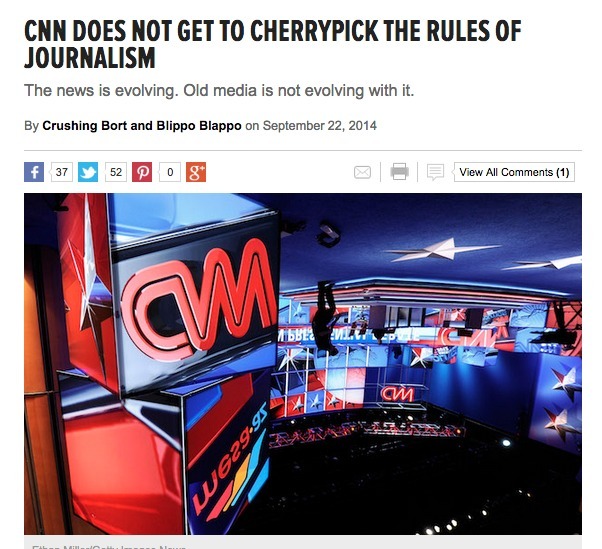 The piece, titled “CNN does not get to cherrypick the rules of journalism,” rips the news network for its double standard in standing by Fareed Zakaria despite extensive documentation on the Our Bad Media blog of plagiarism by Zakaria. Earlier this year, the bloggers noted, CNN fired a news editor for multiple instances of plagiarism. “In its statement announcing her firing, CNN trumpeted its standards of ‘trust, integrity, and simply giving credit where it’s due. '” But, beyond a dismissive statement last month when Our Bad Media published the first of three posts documenting 45 instances of apparent plagiarism, CNN has ignored the accusations against one of its biggest stars. Many journalists and news organizations grant confidentiality too readily, sacrificing credibility in the quest of a story. But I think ESPN handled confidentiality responsibly in its reporting on the response by the Baltimore Ravens and the NFL to Ray Rice’s assault on his fiancée. I hate to call people out but Steve Buttry has some serious chops when it comes to the issue of use of anonymous sources and I’m hoping he’d be willing to contribute his thoughts about how ESPN used anonymous sources in the story and what it does to the credibility of the story and are the reporters able to adequately shore up the weaknesses inherent with the use of unnamed sources in such a controversial piece. Thanks for the kind words, Bryan. I avoid the term “anonymous sources” unless the source is actually unknown to the journalist (as some callers, emailers and online commenters are). We should never use information from those sources in stories because we have no way of judging their credibility. They can provide great tips, and I’ve written stories that started with truly anonymous sources, but we have to get the information from sources we trust, or we can’t use it. If a journalist knows the source, as ESPN clearly did, we have a basis of judging his or her credibility and motives for requesting confidentiality. As I’ve explained before, I prefer to call these sources confidential, unnamed or unidentified. I think those terms are more accurate than anonymous, and calling them anonymous hurts the credibility of our reporting. I’ll never win this fight to change journalism terminology, but I repeat my argument whenever I address the issue. I am leading two workshops this morning for the New York Press Association conference in Port Jefferson. First will be Engage Your Community, which will draw on points I’ve made in lots of different community engagement posts here. Then I will discuss managing your changing workload, which will draw heavily on the lessons of Project Unbolt. My gender has been an undeniable advantage for most of my journalism career. I think I deserved every job or promotion and I think I’ve performed well in each job. But I know that I got more breaks and opportunities than deserving female colleagues. And male colleagues with less achievement and potential also got more breaks. 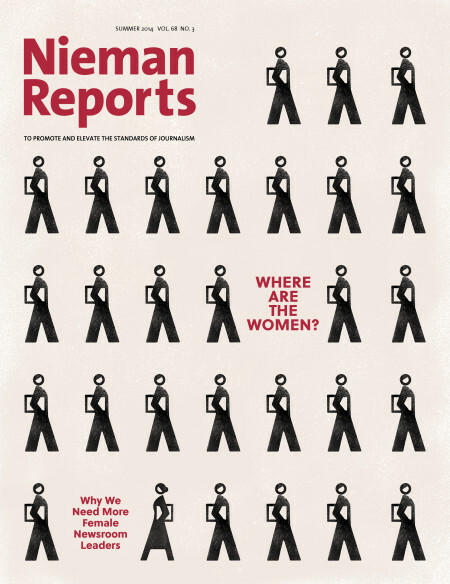 Nieman Reports has published a strong and detailed examination of gender issues in journalism. I encourage you to read it for a more thorough look at the issues and obstacles than you’ll find here. This is just a personal perspective, prompted by the Nieman report: Gender has been a significant – sometimes huge – obstacle for female journalists throughout my journalism career. While it has improved over the long haul, it hasn’t been steady improvement and I wouldn’t argue with anyone who said women have lost ground lately. I’ve worked with a lot of male journalists who rose to upper-level management positions, or even to the top, who weren’t as talented or as accomplished as females who left the business in frustration or never made it to the upper levels. For this post, I’m not going to name names or news organizations. I don’t want to offend or argue with former male colleagues I think have based decisions in large or tiny part on gender, intentionally or without thinking. I don’t want to embarrass any women by discussing their career disappointments or other matters. And I certainly won’t violate the things female colleagues have told me in confidence.